The woman egged at a Donald Trump rally in San Jose, and who is now suing the city, is a featured guest at the Republican National Convention in Cleveland. Tina Hillstrom of Beverly Hills, who founded California's "RealWomen4Trump" about six months ago, was there and found Casey to be much more "soft spoken" than Clark described. "She's a hero," Hillstrom told NBC Bay Area by phone on Tuesday from Cleveland. "Why are people egging her and shoving her? Black lives matter, but no one else's does?" Casey has refused several requests for interviews with NBC Bay Area, the first media outlet to identify her by name after her photo of having egg run down her face went viral. Photographs also capture her flipping off the crowd of people, many of them holding Mexico's flag, before she was smacked with the eggs at the June 2 rally in downtown San Jose. 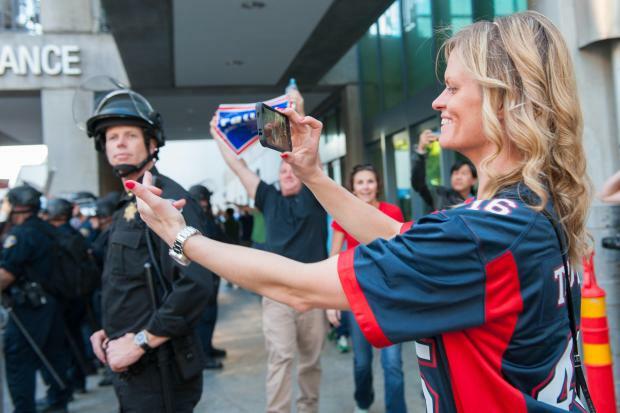 A Donald Trump supporter antagonizes protesters by giving them the middle finger at a San Jose rally outside Marriott hotel on Thursday, June 2, 2016. Last week, Casey, a physical therapist, filed suit against San Jose, the mayor and the police department alleging her civil rights were violated stemming from that rally, along with 13 other plaintiffs. The 44-page suit claims the police did nothing to stop the violence at the rally where the plaintiffs suffered concussions, broken noses and harassment. 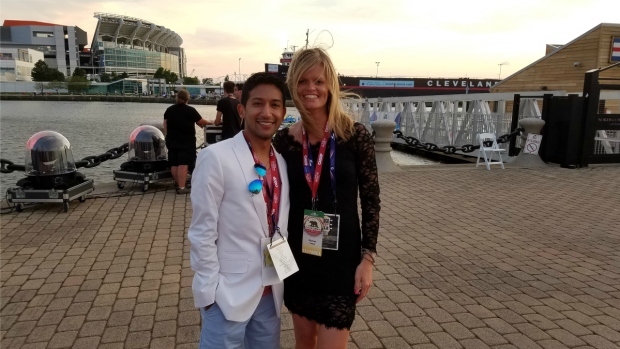 Juan Hernandez of San Jose and Rachel Casey of Florida pose in Cleveland during the Republican National Convention. July 2016. Both are plaintiffs in a suit against San Jose. Juan Hernandez, 39, of San Jose, a rehabilitation counselor in Santa Clara County, is another plaintiff and a Republican delegate in Cleveland now attending the convention in Cleveland. Hernandez told NBC Bay Area in an interview that his nose was broken and he suffered two black eyes when anti-Trump protesters attacked him and a friend. On Tuesday, he said that he's there to support Trump, mostly for his strict immigration policies, and to be a Republican spokesman for California. He's talked a lot with Casey, and said he thought it was awful that she was egged at the rally. "How she reacted was survival mode," he said. "She was assaulted and bullied." Shortly after the rally, Hernandez said he was invited to the RNC by Harmeet Dhillon, the vice chair for the party in California and the lawyer now representing him and Casey in the anti-San Jose suit. But other than that, so far, so good, Dhillon said, adding that she was especially impressed with Meliana Trump’s speech, not wanting to comment on whether portions were lifted from Michelle Obama’s speech in 2008.